Get your keyboards ready and grab your digital seat belts. It's time to get ready for the big digital love ride. 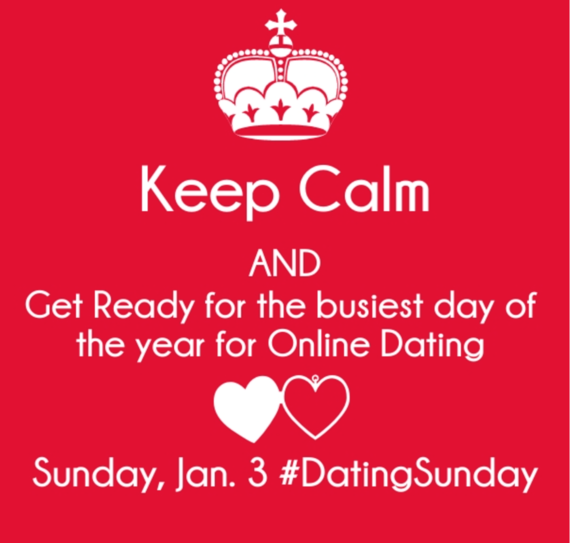 The Sunday January 3rd will be the busiest day of the year for online dating signups. The new year is reflective time for singles. Perhaps you are or were flying solo on New Year's, or were in a relationship that ran it's course. Some couples actually broke up between Christmas and New Year's Eve. It can be a painful time, but with a new year, comes new hope. It's time for a new beginning and the huge amount of new memberships to online dating sites will happen on the Sunday after New Year's, January 3rd. Here are some statistics and numbers worth looking at. PlentyofFish expects 81,000 signups on Sunday and is expecting two million signups in the month of January. Singles who join during the first week of January, will find their partner an average of two weeks faster than those who sign up later, taking an average of just 10 weeks, as compared to an average of 12 weeks throughout the year. Match reports that 24% more signups will occur on January 3rd, #DatingSunday, with 8:52pm/ET being the most active time of the day. During the peak season from Christmas through Valentine's, they will see a 60 % spike in new singles searching for love. With one million new dates happening during this period, those are numbers worth bragging about. At Cyber-Dating Expert, our phone has been ringing and the text messages have been flying. We know that it's peak season now through Valentine's Day, so grab your smartphones and download the latest mobile dating apps. It's time to get ready to fill your date card! Year-round, Sunday is the most active day. If your weekend date was so-so, or you were dateless, you'll have time to log on to chat, flirt, and browse. This makes it easier to fill your date card and start the week anew. Multiply this big time with the start of a New Year, with all of your new resolutions, and you'll see the activity soar. Some people stayed in dead-end relationships so they wouldn't be alone through the holidays. It's a dreadful feeling to know that you're with someone you can't see yourself going the distance with long-term. Thoughts of another New Year's Eve with that feeling isn't something you'll want to repeat. Often, couples will break up right after the New Year, or even before Christmas, in order to not to go through another holiday with the wrong person. On The Huffington Post blog, I wrote an article, How to Break Up Gracefully. Please read it before calling it quits with your significant other, as you should always take the high road and avoid text and voicemail breakups. Know that it's normal for relationships to run their course, but when it happens at the holidays, it brings a whole new group of fabulous singles to the dating party at the first of the year. There's a reason they say, "Out with the old, in with the new" at New Year's. Emotions around the holidays and New Year's are at an all-time high if you're single. Watching your friends post lovey-dovey shots on Facebook and Instagram, or change their status to "In a Relationship" or "Engaged," can hit a nerve big-time. It's enough to make you scream, "Bah, humbug" and turn off both your computer and phone to unplug, but please don't do so on January 3rd, when you have the greater chance of connecting with someone new. New Year's resolutions often include finding love. New Year's Day is on a weekend this year. It's the perfect time to reflect about the past year and come up with a list of goals for 2016. After watching football games and going to New Year's Day parties solo, singles often think about new beginnings. From joining a gym to going on a diet, the list often includes finding someone to have a meaningful relationship with. During peak dating season, Match reports that about 50 million messages are sent. Think about it. Wouldn't you be happy to receive at least 10 of those emails from someone you could have chemistry with? Plenty of Fish reports that on Sunday, January 3rd, they will have 35% more signups than the first three Sundays in December. Rather than sitting back and waiting for your inbox to fill up, remember that the more engaged you are, the greater chance you'll have to find love in 2016. That means logging on several times a day so your profile stays active, viewing your daily matches every day and liking and messaging other members to start a conversation, right now. Are you ready to join the world's largest digital party on Sunday night? Happy #DatingSunday. Wishing you much love and joy in cyberspace, or wherever you may roam. Julie Spira is America's Top Online Dating Expert and Digital Matchmaker. She's the CEO of Cyber-Dating Expert and was an early adopter of Internet Dating. Julie's been coaching singles for over 20 years with her Irresistible Profiles programs and is a frequent guest in the media on the subjects of online dating and mobile dating. For dating advice, sign up for the free Weekly Flirt newsletter and follow @JulieSpira on Twitter, Instagram, and Facebook.